After skin cancer surgery took a large portion of the side of my nose, Dr. Talbott was able to work miracles to make me look great again. – K.P. 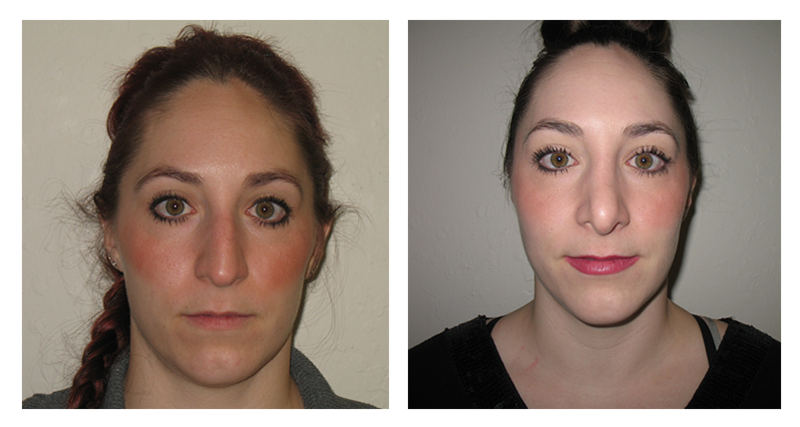 Rhinoplasty in Reno, NV is usually performed under general anesthesia as a same-day surgery. Depending on the desired result and the complexity of your specific problem, the surgery may take anywhere from one to three hours. The details of the specific type of nose surgery suited to your specific aesthetic concerns and functional requirements, and the placement of the incisions is determined and discussed at length with Dr. Talbott during the first consultation. There are risks and complications with all surgical procedures such as bleeding and infection. These, as well as complications specific to rhinoplasty, will be discussed at the time of your consultation. First post-operative visit within 48 hours after surgery: Check for bleeding, level of discomfort, and to address any immediate concerns. One week after surgery: Splint is removed, sutures (if external sutures are required) are removed, in spite of swelling, difference in appearance of nose is often immediately evident, resume normal light daily activities. 10 – 14 days after surgery: Return to work, most of the bruising is usually resolved, swelling reduced, vigorous activity (exercise, heavy lifting) are usually restricted until about three weeks after surgery. Contact sports can be resumed at six to eight weeks after surgery. 6 – 8 weeks after surgery: Swelling significantly reduced; resume normal activities, exercising etc. 3 – 6 months: Most of the swelling gone. 6 months – 1 year: Remainder of swelling disappears. The dorsum refers to the top of the nose. Normally it is straight or has a gentle convexity towards a more projecting nasal tip. The dorsum of the nose may be satisfactory when viewed from the front, but may show too much projection when viewed from the side. The nose, as the central feature of the face, has a significant effect on facial aesthetics. The nasal dorsum determines the character of the nose. When the dorsum of the nose is concave or has a bump or hump, this may interfere with the desired profile. In addition to the height and configuration of the nasal dorsum, the projection and shape of the nasal tip affects the nasal profile, and the contribution of both of these factors must be considered. Moreover, the quality of the skin is especially important in nose surgery. Thick skin may not allow the altered anatomy to show through, whereas very thin skin may show any slight irregularity. When doing a nose reshaping surgery, a number of surgical techniques are available to reduce the dorsal hump and create better balance to the shape of the nose. 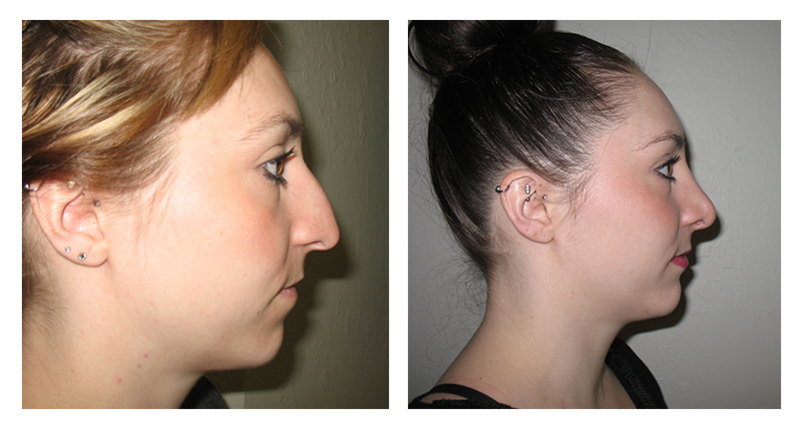 Another common concern with which rhinoplasty patients seek Dr. Talbott is a wide, ‘bulbous’, or ‘boxy’ tip. This is most often hereditary and may be partially a result of a thick nasal skin. Most patients seek refinement of the tip, and this must be carried out by the plastic surgeon in such a manner as to maintain the natural appearance of the nose. A tip that is too pointy or small, particularly in proportion to the rest of the nose may result in an unnatural, “operated on” appearance. In patients with thin nasal skin, a wide tip is a consequence of large or splayed cartilages that form the tip. In order to increase the precision of reshaping and resizing the tip, Dr. Talbott uses an open-approach rhinoplasty technique. This method facilitates direct visualization of the nasal cartilages. It also increases the predictability of the final surgical result. The open approach also allows for precise suturing of the nasal cartilages to reshape and refine them, as well as position them more accurately. A nose may be crooked as a result of heredity, previous surgery, or trauma. It may be crooked in certain portions (tip, bridge, nostrils), or the entire nose may be asymmetrical. Regardless, Dr. Talbott will determine what structural problem is causing the asymmetry. It may be a cartilage problem (e.g. the septum), a bone problem, or combination of both. The specific procedures to address the asymmetry will depend on these structural factors. Often, obstructed nasal breathing accompanies asymmetry of the nose, and these can be corrected using the techniques mentioned below. The surgery may include cutting and repositioning the nasal bones (osteomies), reshaping the nasal septum (septoplasty), septal extension, cartilage grafts and a variety of other techniques with which Dr. Talbott is familiar with. Contact the Talbott Plastic Surgery Center in Reno, NV to learn more about rhinoplasty and to schedule a consultation.